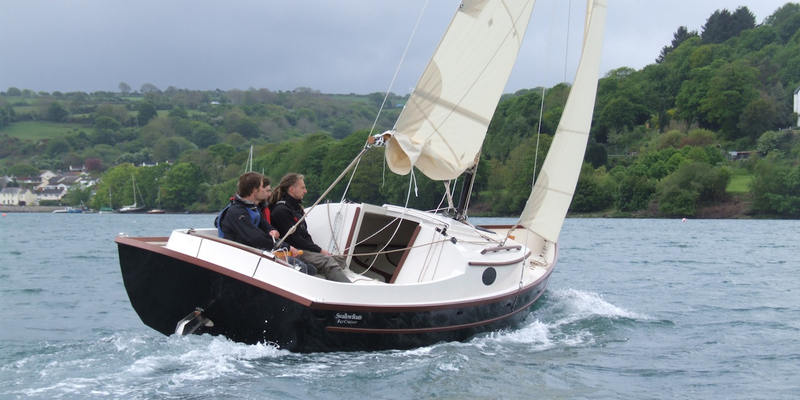 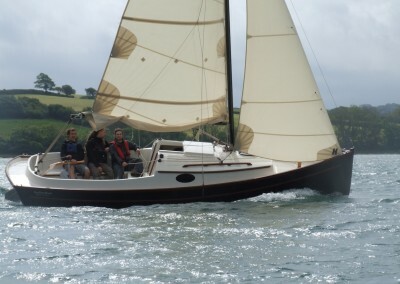 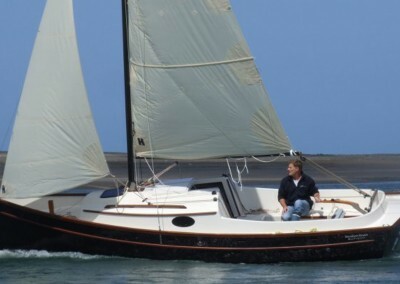 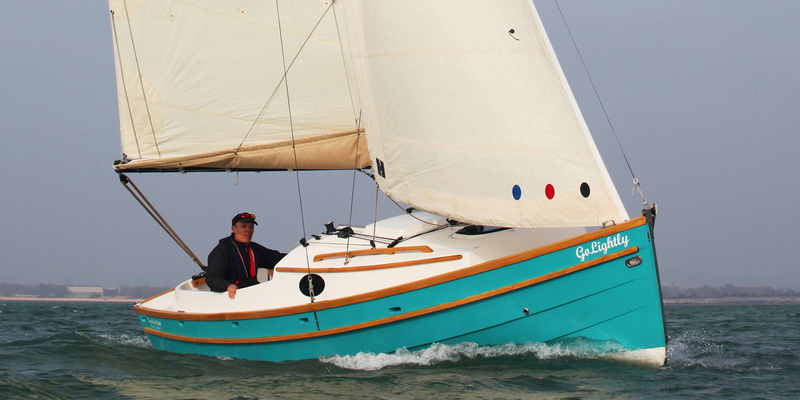 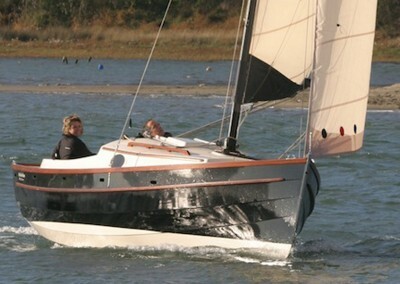 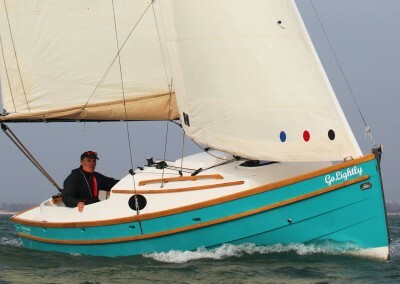 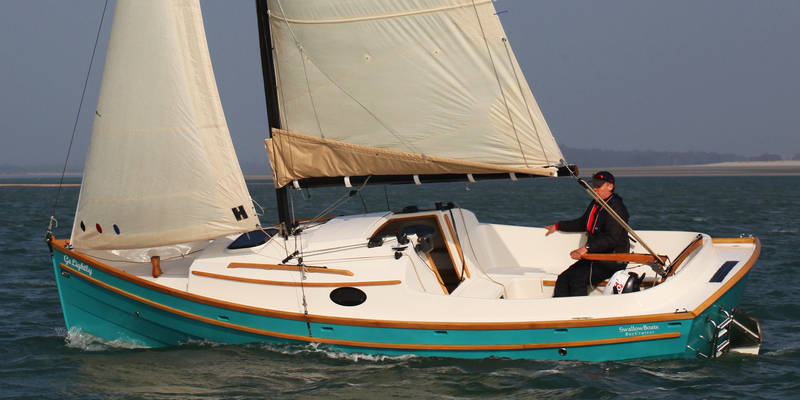 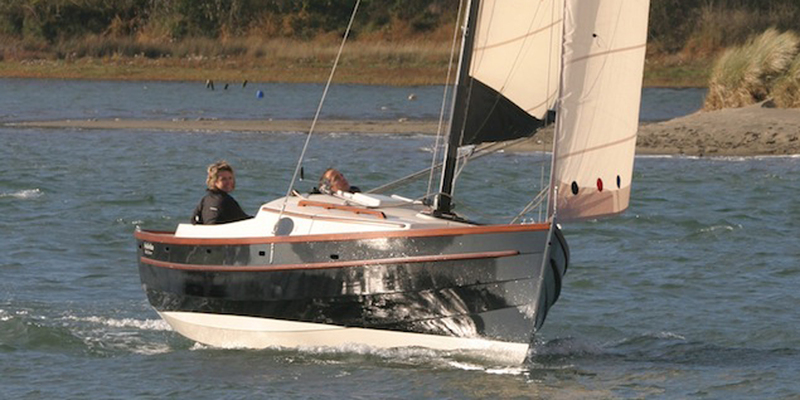 Like many of the boats in our range the BayCruiser 23 is water ballasted, though she also carries a significant portion of lead in her deep profiled centreboard. 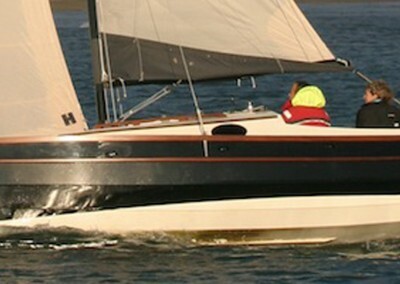 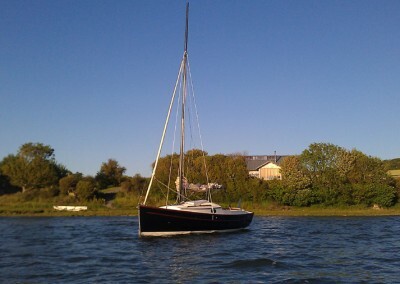 Her lightweight carbon rig makes her much easier to trailer sail than than many smaller boats. 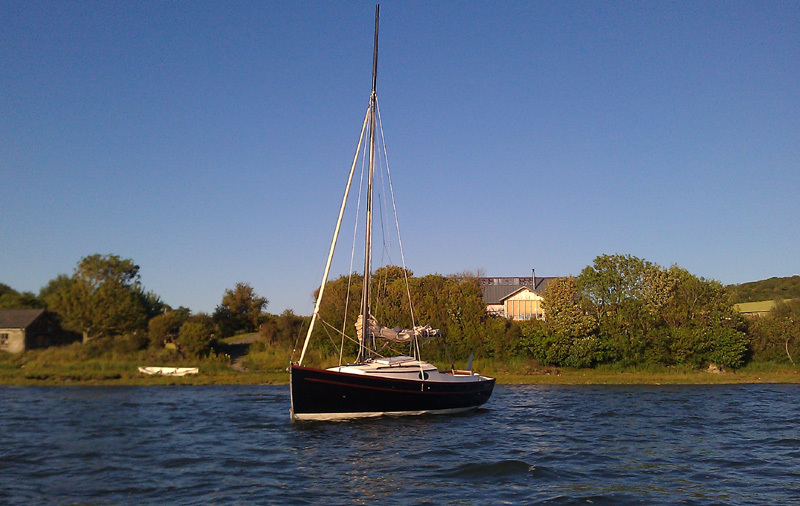 The mast is easy to raise, and she can be fully rigged from the trailer to launching in about 30 minutes – less if there are two of you. 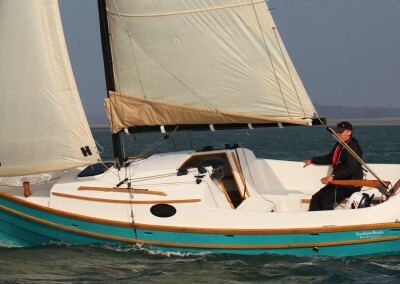 She stores 500kg of water in two tanks, one under the vee berth, and the other under the cockpit floor. 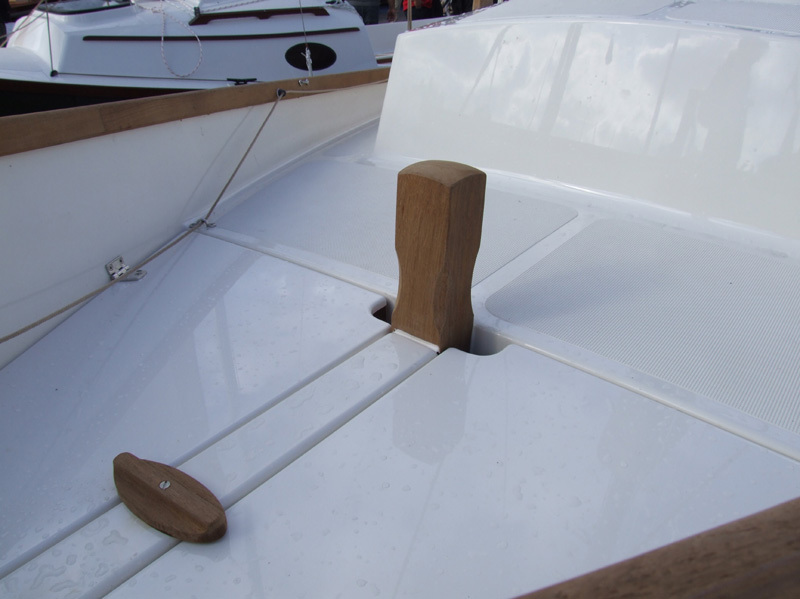 They are both under the waterline so fill under the weight of the boat alone. There is a large capacity bilge pump to pump them dry which can be diverted to pump the cabin bilge. 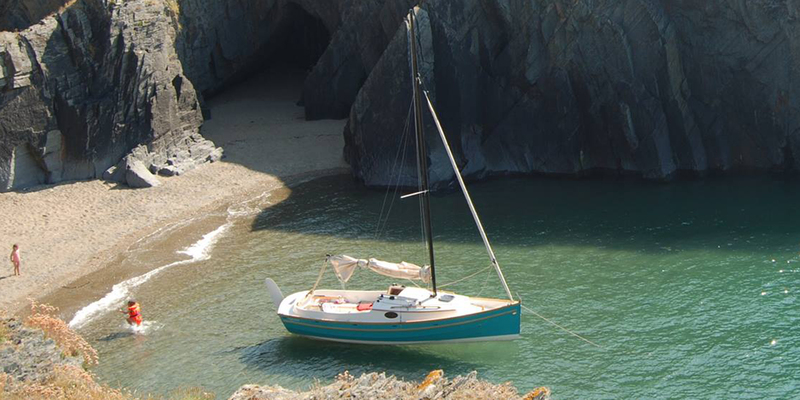 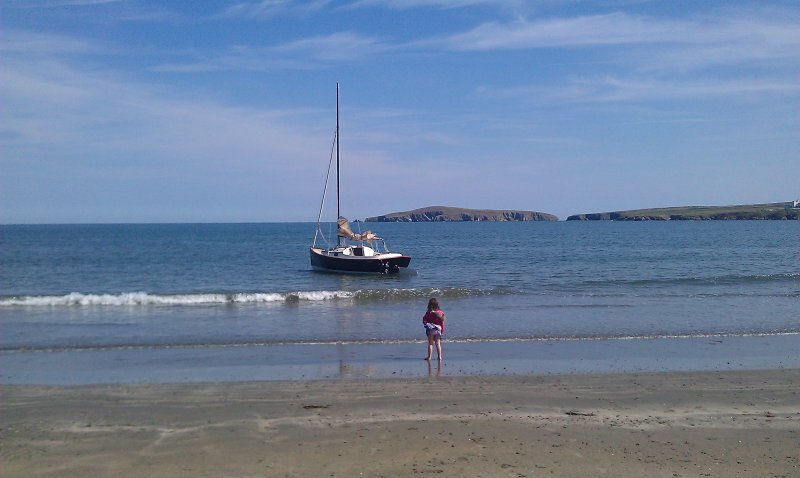 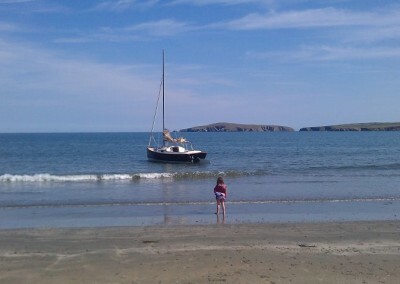 Alternatively the boat can be left to drain as you winch her onto her trailer, or just left full on her mooring. 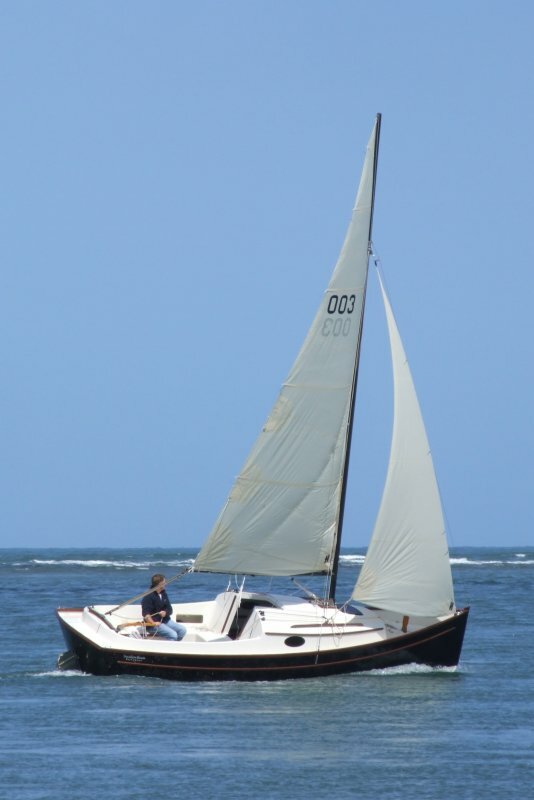 The water ballast means the boat can be extraordinarily easy to tow, launch and recover, and very quick in light winds too. 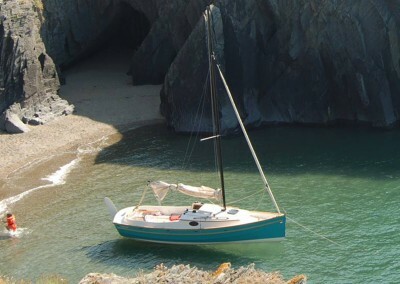 In tougher conditions, or when you just want the security of knowing you have a self righting boat, simply fill the tanks, and the whole character of the boat changes. 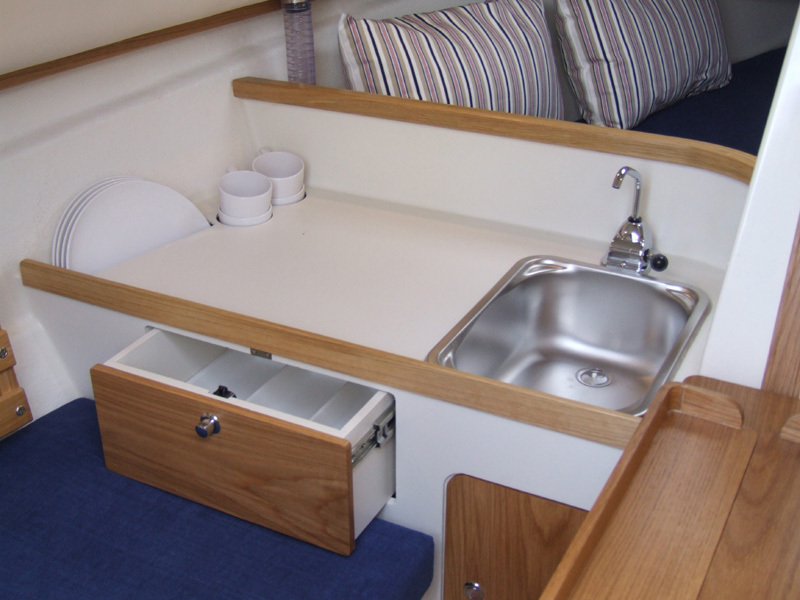 The BayCruiser 23 has a comfortable interior with plenty of sitting headroom around the folding saloon table. Two quarter berths each side and a large v-berth in the forepeak allow sleeping for 4 adults. 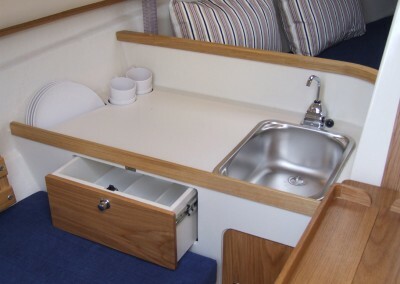 A dedicated galley space on the port side has a stainless sink and pumped water supply with room for a hob type cooker. 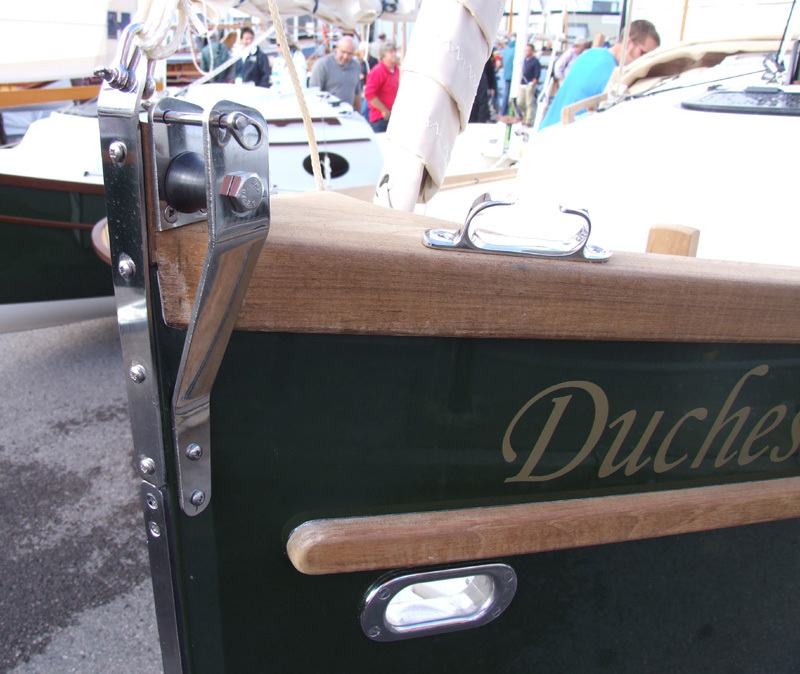 Under the vee berth forward there is room for a chemical toilet or marine head. 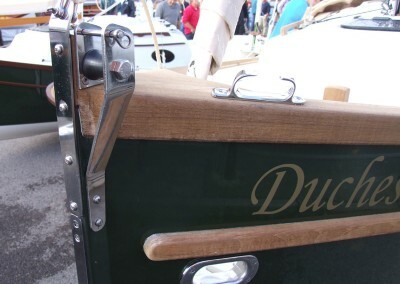 The centreboard case is capped by a solid oak folding table that removes to gain access to the centreboard. 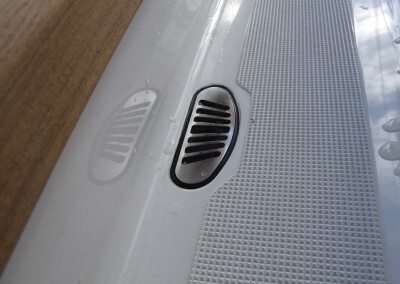 Buoyancy chambers have twist hatches for inspection and there is additional storage room under the seats and under the vee berth (above the water tank). 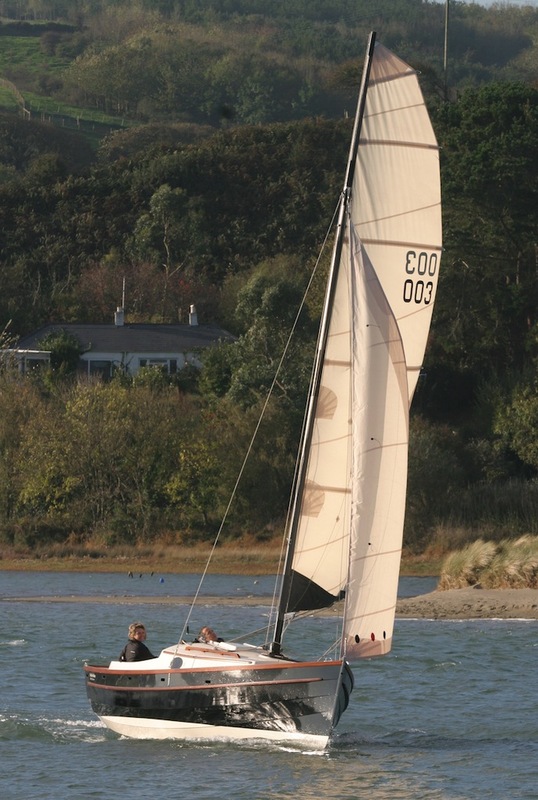 The style inside is simple but light and airy, with painted tongue and groove and oak trim. 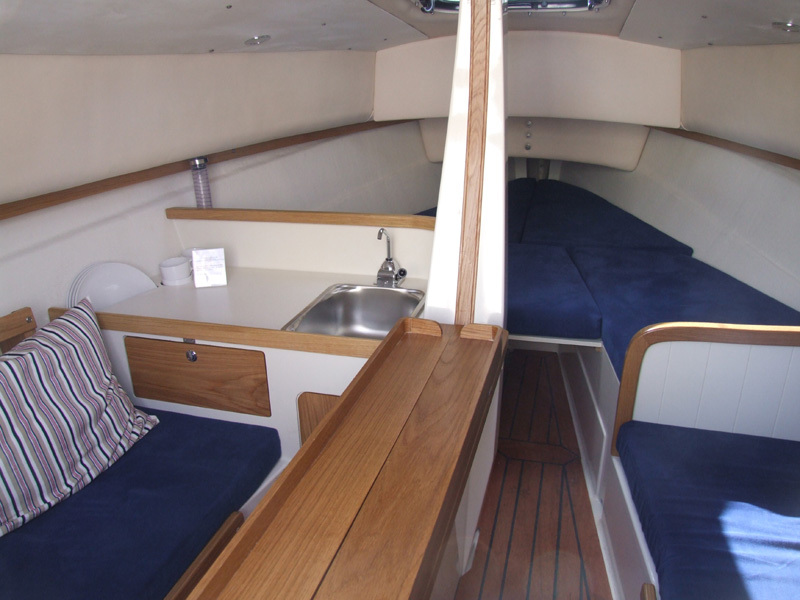 We offer a huge range of fabrics for the cushions inside and are able to tailor the interior decor to suit your taste. 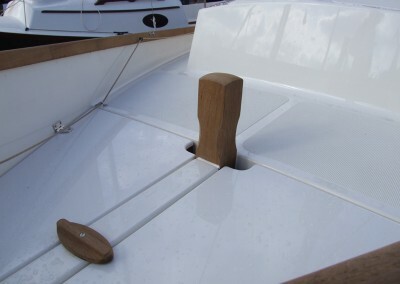 The cockpit has comfortably angled coamings giving great back support and a feeling of safety while the seats on either side have been spaced for good bracing when heeled. 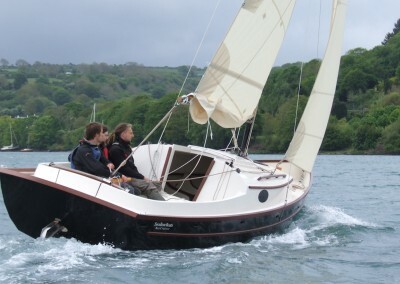 An optional spray hood covers half the cockpit enabling the helmsman and crew to shelter from foul weather while at the tiller. 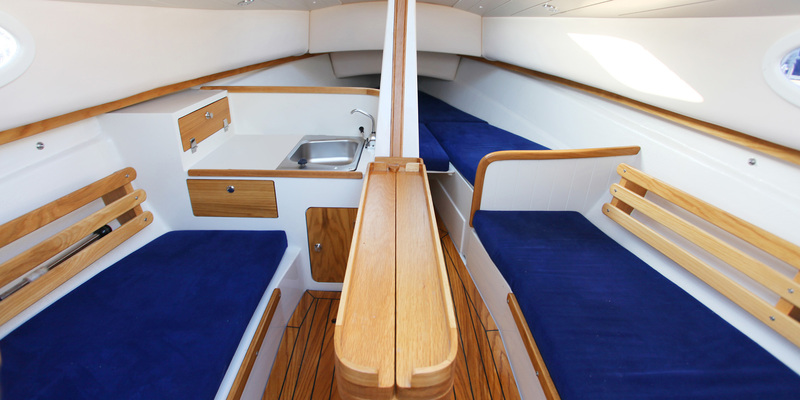 It also keeps rain out of the cabin when the companionway is open. The engine options are numerous but the most popular is a 5-6HP standard shaft outboard engine. 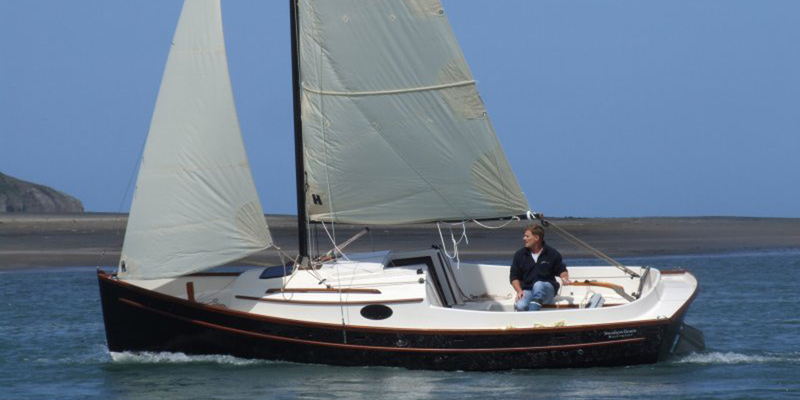 It sits in a well on the centreline, thrusts onto the rudder for good steerage, and is well buried to guard against cavitation. 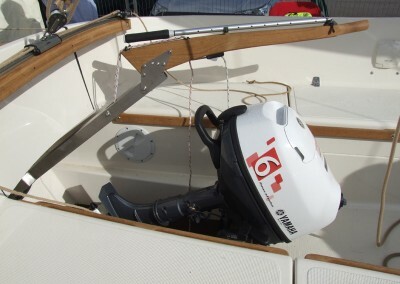 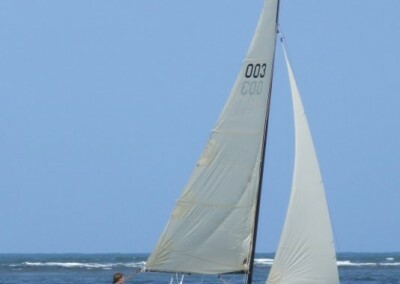 It is also easy to reach from within the cockpit, kicks up for less drag when underway, which also makes for easier launching in shallow water. 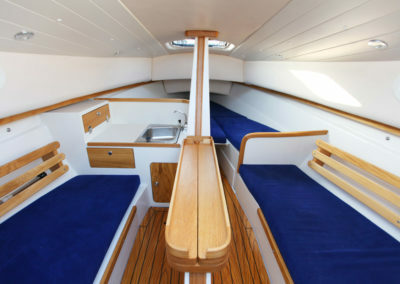 Up in the bows there is a large anchor locker accessible from the deck, with an additional headsail locker next to it. 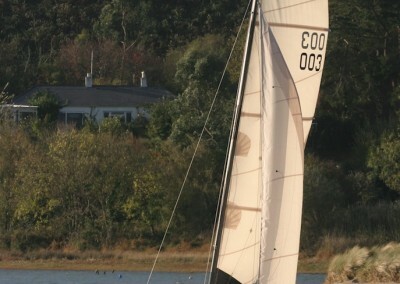 A large Sampson post between the two gives a strong point for mooring. 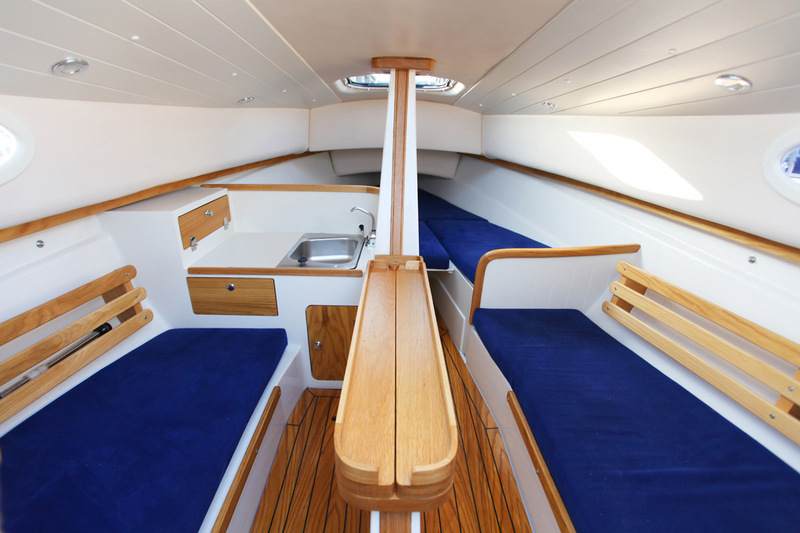 The raised hull sides (bulwarks) give a feeling of security on the foredeck and it is a comfortable place to sit and watch the world go by.